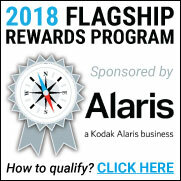 The Kodak Alaris Partner Program gives you more opportunities to grow your business by teaming up with Kodak Alaris. Our world-class imaging solutions and beneficial programs can translate to greater sales volume and profit potential for you. Combine our dynamic channel programs, strong brand identity, industry leadership and renowned service and support with your expertise to deliver complete solutions that can help take your business to the next level. It's easy to get started and become an Advantage Reseller.